What is Yin and Yang for feng shui? Some of us know that the universe has 'Chi' or 'Qi'. The balance of 'Chi' will be the 'Yin' and 'Yang' for harmony of the mother earth. This is similar to the law of polarity as the earth & the sky is like a huge capacitor - negative charge on earth and positive charge in the sky. Therefore the Yin and Yang will be a balance between the Heaven & Earth. The black represents the Yin while the white represents the Yang. It is said the existence of Yin will be the Yang and the existence of Yang will be Yin. 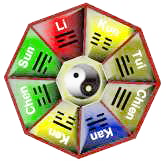 So, the concept of fengshui will be creating a balance between Yin & Yang forces. Either force cannot exist without the other. If you are able to master the principle of Yin and Yang, you will then be able to control your life, working environment and your wealth. 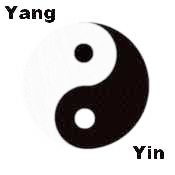 Yin is classified as the Feminine while the Yang is said to be the Masculine. As we have learned the theory of magnetism, opposite force attracts while similar force repels. Therefore, Yin represented by female while Yang represented by male therefore it will attract each other as shown by the Yin & Yang diagram. This is the harmonious balance between both Yin and Yang. In view of the Trigram, the forces of Yin and Yang are represented by the straight line and the broken lines. The Yin represents by the broken lines while the Yang is the straight line. This Kun symbol is represented by Yin. What happens when there is an imbalance between the Yin and Yang? This imbalance will cause unwanted emotional and physical effects like fatigue, depression and lack of motivation in life. Feng Shui is a concept of Common Sense. Example, if a room is dark then you need to introduce light into the room to balance. Or if the room is too bright then using curtains or blinds to shade the brightness to balance the Yin and Yang. Same goes if the room is too hot or too cold, by adjusting the air-con to the right temperature will balance the Yin & Yang. The formation of the Eight Trigram is based on the Yin & Yang.